JOHN QUINCY ADAMS. 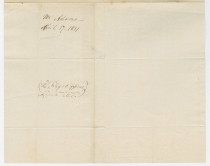 Autograph Letter Signed, to Richard Rush, April 17, 1831, Washington, D.C. 2 pp., 8 x 10 in. With recipient’s docketing. Their present experiment does not appear likely to last longer than those which preceded it, and the House of Commons is already exhibiting majorities against them upon propositions of their Chancellor of the Exchequer. This Lord Althorp begins his career by proposing a duty of a penny a pound upon raw Cotton from the United States, which may be considered as an indication of the ministerial feeling towards this Country. It would seem from the movements at Manchester and in London after the proposition was made in Parliament, that this Step had been taken, without previous consultation of the great interests at home to be affected by it; and it remains doubtful whether it will yet be carried into effect. But the great and absorbing interest for the present appears to be concentrated in Lord John Russells Plan of Parliamentary Reform. 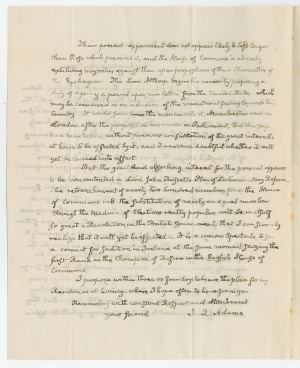 The retrenchment of nearly two hundred members from the House of Commons, with the substitution of nearly an equal number through the medium of Elections really popular, will be in itself so great a Revolution in the British Government, that I can scarcely realize that it will yet be effected. It is a curious spectacle to see a convict for Sedition in Ireland at the same moment seizing the first Rank as the Champion of Reform in the English House of Commons. I propose within three or four days to leave this place for my Residence at Quincy, where I hope often to hear from you. In the United Kingdom, seats in the House of Commons were often controlled by powerful patrons, and many called for democratic reforms to broaden the suffrage and make representation more effective. Calls for reform became more common in the 1820s, and Whig leader Lord John Russell in the House of Commons led the reform cause. When King George IV died in June 1830, Parliament dissolved by law, and the kingdom held a general election. Electoral reform became a key issue. Although the Tories won a majority in the election, the party was divided. When the Prime Minister, the Duke of Wellington, opposed any reform, he was ousted through a motion of no confidence. Whig reformer Charles Grey replaced Wellington as Prime Minister. On March 1, 1831, Lord John Russell brought forward the Reform Bill in the House of Commons. However, the bill proved unpopular, and the administration lost a procedural vote. They requested a dissolution and took their appeal directly to the voters. In the general election of 1831, the Whig Party gained 174 seats because of the popularity of reform. In September, a Second Reform Bill passed the House of Commons by a majority of more than one hundred votes, but the House of Lords rejected it in October. The Lords’ action led to public violence, and the Whig majority in the House of Commons urged King William IV to prorogue Parliament. When a new session of Parliament began in December 1831, the Whigs brought forward a Third Reform Bill. It passed the House of Commons in March 1832 and was sent to the House of Lords. Lord Grey insisted that the King create enough new peerages to carry reform in the House of Lords. The King refused, and Grey resigned. The King invited the Duke of Wellington to form a new government, but he could not do so in the face of public pressure for reform. The King recalled Lord Grey and agreed to create new peers if necessary. Enough opposing peers abstained, and the Third Reform Bill was able to pass the House of Lords, receiving Royal Assent in June 1832. The Act abolished fifty-six rotten boroughs and reduced the membership of thirty more, creating new seats in English and Welsh counties and large cities, while expanding the number of voters by more than 60 percent. Separate reform acts gave Scotland eight additional seats in the House of Commons and Ireland five. John Quincy Adams (1767-1848) was born in Massachusetts, the son of future President John Adams. He accompanied his father on several diplomatic missions in the 1770s and 1780s and graduated from Harvard College in 1787. He studied law and was admitted to the bar in 1791. Adams served successively as minister to The Netherlands, Portugal, Prussia, Russia, and Britain, from 1794 to 1801 and from 1809 to 1817. He began his career a moderate Federalist but switched to the Jeffersonian Republican Party around the year 1807. He helped negotiate the Treaty of Ghent, ending the War of 1812, and was a brilliant Secretary of State (1817-1825), taking the lead role in formulating the Monroe Doctrine. He won the election of 1824, which was decided in the House of Representatives because no candidate won a majority in the Electoral College. Adams’s “deal” with House Speaker Henry Clay, whom he named Secretary of State, helped spark the formation of an opposition party around Andrew Jackson. John Quincy Adams served one largely frustrating term as president and lost in the election of 1828 to Andrew Jackson. Surprising most observers, Adams stood for election to the House of Representatives in 1831 and served seventeen memorable years, becoming a bulwark for civil liberties and a voice in the emerging anti-slavery movement. He defended the Amistad slaves before the Supreme Court in 1841, and died of a stroke on the floor of the House in 1848. Richard Rush (1780-1859) was born in Philadelphia. His father Benjamin Rush was a prominent physician and signer of the Declaration of Independence, and his mother was the daughter of Richard Stockton, another signer of the Declaration of Independence. Richard Rush graduated from the College of New Jersey (Princeton) in 1797 as the youngest member of his class. He gained admission to the bar in 1800 and became a successful trial lawyer. In 1809, he married Catherine Eliza Murray, with whom he had ten children. In 1811, he became the Attorney General of Pennsylvania, but later that year, President James Madison appointed Rush as Comptroller of the Treasury. 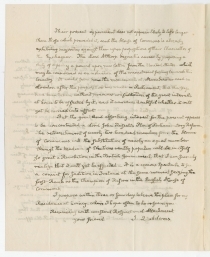 In 1814, Madison appointed Rush as Attorney General of the United States, a position he held until 1817. He also served as acting Secretary of State from the beginning of James Monroe’s administration until John Quincy Adams returned from Europe. In October 1817, Monroe appointed Rush as Minister to Great Britain to succeed Adams. He served as American Minister in London until 1825. 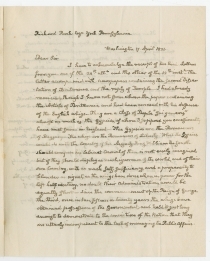 That year, President John Quincy Adams nominated Rush to be Secretary of the Treasury, a position he held from 1825 to 1829. During his tenure, he paid off most of the public debt and passed to his successor a large surplus in the treasury. In 1828, he was Adams’ running mate, but they lost to Andrew Jackson and his running mate John C. Calhoun. From 1847 to 1849, he served as Minister to France during the presidency of James K. Polk and was among the first foreign diplomats to recognize the French Second Republic. In fine condition. Accompanied by a gorgeous custom-made presentation folder with a quarter leather binding. John Charles Spencer, Lord Althorp (1782-1845) served in the House of Commons beginning in 1804. In March 1830, he became the leader of the Whigs in Parliament and was expected to become Prime Minister when the Duke of Wellington was forced out. Instead, he persuaded Lord Grey to become Prime Minister, and Althorp became Chancellor of the Exchequer and leader of the House of Commons. In that role, he played an important role in persuading Parliament to pass the Reform Bill of 1832. On his father’s death in 1834, Spencer became the 3rd Earl of Althorp and moved to the House of Lords until 1835, when he retired from politics. Probably a reference to Daniel O’Connell (1775-1847), the Irish political leader who sat in Parliament from 1828 to 1841, and strongly supported the Reform Act of 1832, though he always put Irish political interests first.